We have two Helichrysum hydrosols at Stillpoint Aromatics. One is from our Artisan distiller in Washington state here in the USA and the other from our fabulous distiller in Corsica. The healing properties of both helichrysums are the same but the energetics and aroma of the two are quite different. 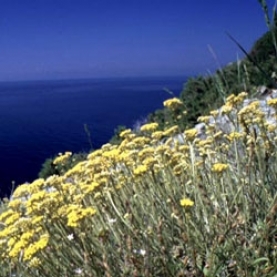 This helichrysum hydrosol from Corsica is bolder and stronger in aroma and taste. There is a greater semblance to Helichrysum essential oil.